OK, help me out, here. When I was in kindergarten, my classroom had all the Schaeper Toys games--Cootie, Ants in the Pants, and Don't Break the Ice. Don't Break the Ice is still around (but I'll be damned if the purple guy on his back on the box doesn't look just like Grimace to me). You use a little pick to hammer out ice cubes and try not to break the ice. Duh. 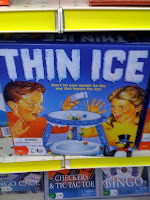 But at the dollar store (again, costing more than a dollar), I saw this game: Thin Ice. Looks like you pile marbles on the fake ice and, again, try not to break the ice. Homage, or rip-off? Or is there room in the world of toys for two ice-breaking kid games?